The Squier Vintage Modified Mustang in Sonic Blue combines the vintage-look and sound of the original 1960s student-focussed Fender Mustang, with the playing specification and reliability of a modern guitar. This gives you the ideal balance of vintage good-looks and tones with a modern playing feel to keep up with any contemporary guitar. The Vintage Modified Mustang features classic appointments inspired by the '60s Mustang including the unique pickup on/off electronic switches and the effortlessly-cool offset body shape. The Vintage Modified Mustang also features a period-correct short scale-length (24'') which is ideal for players with smaller hands. The shorter scale-length makes general playing easier, while the modern 9.5'' radius and medium jumbo frets give a modern playability that today's players will find effortlessly comfortable. Many vintage-inspired design features give you the stand-out looks of the original Mustang, including the distinct off-set body shape, vintage-tinted gloss neck, and classic paint finish. 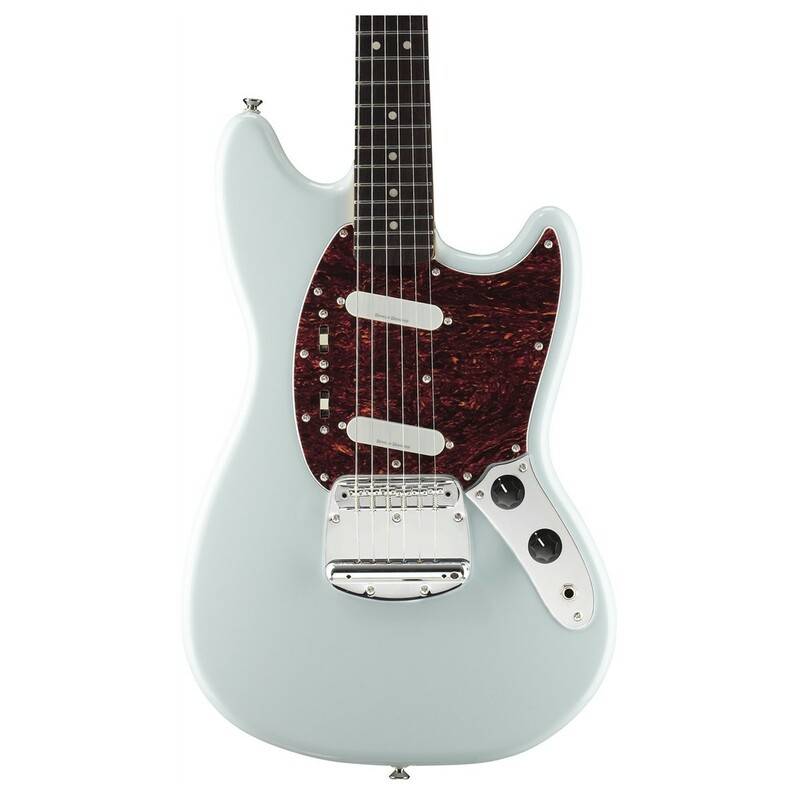 The Fender Mustang became a popular instrument with rockers and indie players, so if you're looking for an alternative to the ubiquitous Stratocaster and Telecaster with an easier playing-feel courtesy of the 24'' scale, the Squier Vintage Modified Mustang will help you stand out from the crowd. Please note: guitar pictured has rosewood fingerboard. Guitar for sale has laurel fingerboard. Images will be updated soon. 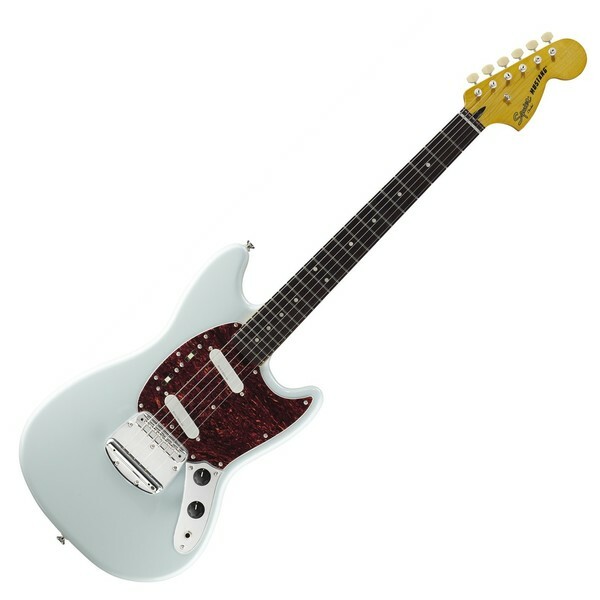 The Squier Vintage Modified Mustang takes its design inspiration from the Fender Mustang of the 1960s. The original Fender Mustang had a short scale-length, created to give students with smaller hands an easier playing feel. The Mustang had a unique visual identity that made it unexpectedly popular with alternative rock and indie musicians. 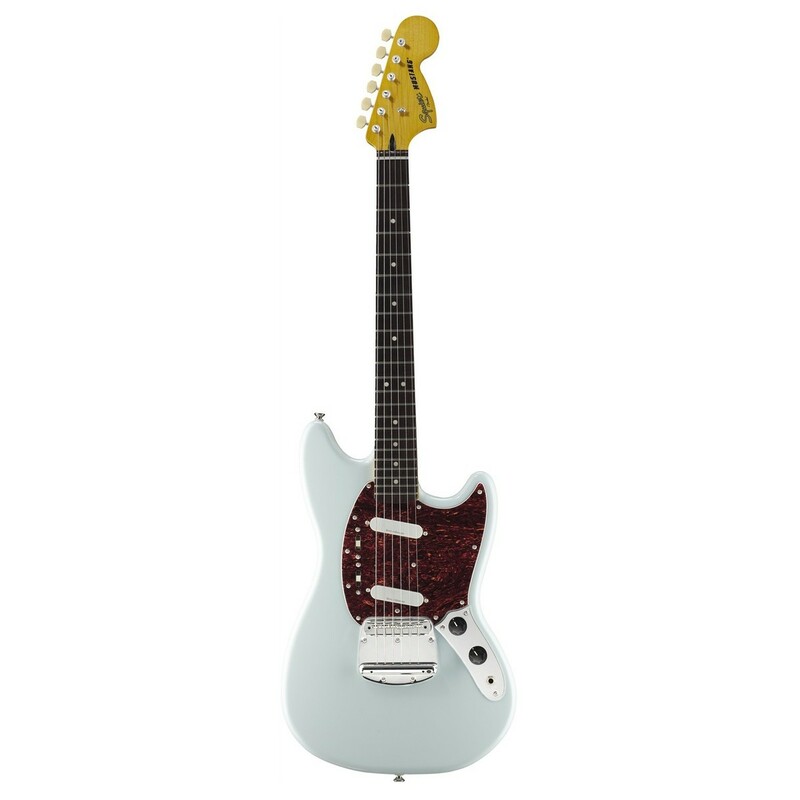 The Squier Vintage Modified Mustang has the same look and sound of the original '60s Fender design including the distinct offset body, unique electronics and short 24'' scale length. The Squier Mustang gains the 'Modified' moniker due to its modified playability; this gives the guitar an up-to-date feel, allowing it to keep up with contemporary instruments. A basswood body is chosen for its versatile performance, with a balanced frequency response and light weight for a comfortable feel during long playing sessions. The body is crafted with the classic Mustang offset body shape, giving an effortlessly-cool look and easy access to the top-frets along with a manageable dimension for younger players. The maple neck is finished with a vintage-tint gloss finish, so you'll have the authentic look of a vintage guitar. The Mustang is defined by its shorter (24'') scale length, which gives the strings a "slinkier" feel and makes the fret spacing narrower for an easier playing feel. This makes chordal and solo work easier and is ideal for those with smaller hands or for musicians who prefer an easier action for string bends. The neck has a "C" shaped profile that enables easy reach over all 6-strings, while the offset body enables easy access to all 22 frets. The Mustang is loaded with two Duncan Designed MU-102 single coil pickups to provide the nuance and bite that this guitar design is known for. The pickups are wired with unique electronics - each pickup has an individual on/off control to create independent and blended sounds. Two controls are supplied for master volume and tone adjustments, making this guitar very intuitive to use. 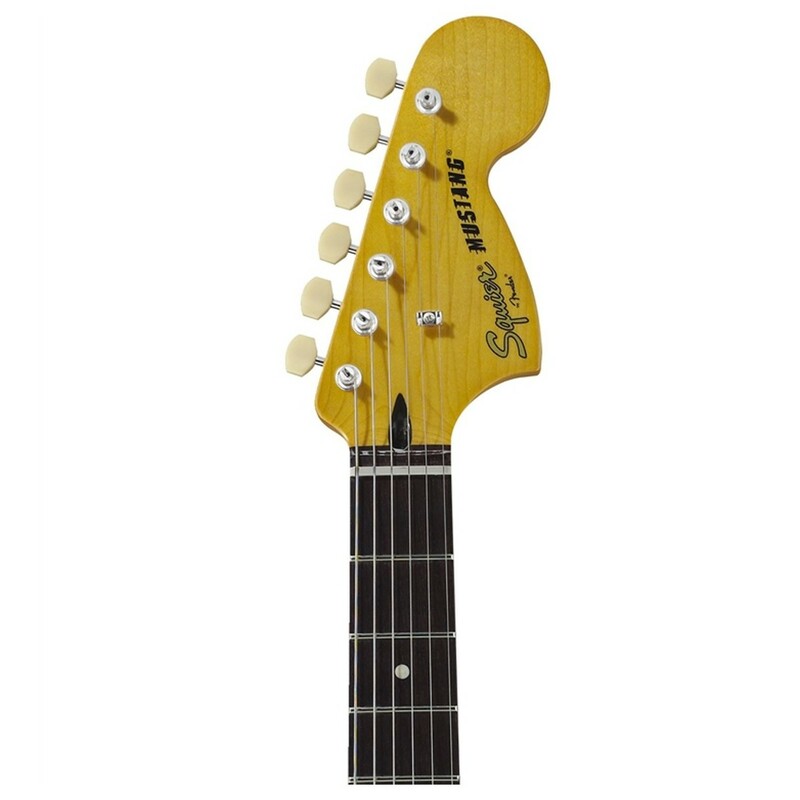 The Squier Vintage Modified Mustang takes its inspiration from the original '60s Fender Mustang design. The original Mustang was created as part of a revamp of Fender's student models, where the shorter scale-length and more manageable body proportions helped younger players approach the guitar. In the '90s the Mustang gained cult popularity with rock and indie musicians; today it is one of the most collectable of all the Fender short-scale instruments.